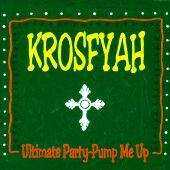 Krosfyah - "Ultimate Party - Pump me up"
Soca has never been so cool! Combat boots, baggy attire, brightly colored bandanas adorning funky dreads and coloured 'fros; krosfyah epitomizes coolness. Combined with infectious melodies, high-energy performances and pulsating rhythms that speak a language only one's hips comprehend, krosfyah has reinvented soca as we know it. In 1994, krosfyah released their debut album, Ultimate Party, which propelled the group from obscurity to the most popular soca band on the island of Barbados and won them the coveted "Band of the Year" title.